Former Texas Governor Rick Perry spoke before the Senate Energy and Natural Resources Committee yesterday. He is seeking confirmation as Donald Trump’s Secretary of Energy. In his opening statement, he said “I am committed to modernizing our nuclear stockpile, promoting and developing American energy in all forms, advancing the department’s critical science and technology mission, and carefully disposing of nuclear waste.” Each of these are mission-critical statements for the Department of Energy and none of them were controversial. He has set himself apart from his boss in good ways. On nuclear weapons, there’s no flippant language. On the role of science, he’s pointed to respect for and protection of a long-term R & D process. Importantly, he acknowledged that climate change is happening and that people are part of the cause. But his statements about climate are still loaded with weasel words. As I’ve said before, this is no time to wear rose-tinted glasses. Perry’s statements aren’t cause for outright despair but they aren’t thrilling given his track record. Of course, he had the famous line in the 2012 primary when he said he’d shudder the Department of Energy (though he couldn’t name the department at the time). He now says, “In fact, after being briefed on so many of the vital functions of the Department of Energy, I regret recommending its elimination.” People running for office say absurd things. They double down and in the context of Tea Party politics, sadly anything went in a race to the bottom. Perry’s climate change statements have been pretty ugly. At the hearing he said, “I believe the climate is changing. I believe some of it is naturally occurring, but some of it is also caused by manmade activity. The question is how do we address it in a thoughtful way that doesn’t compromise economic growth, the affordability of energy, or American jobs.” I’ll let the third sentence go. But the first two are misleading, much the way EPA Secretary nominee Scott Pruitt’s climate change comments were earlier this week. History matters. 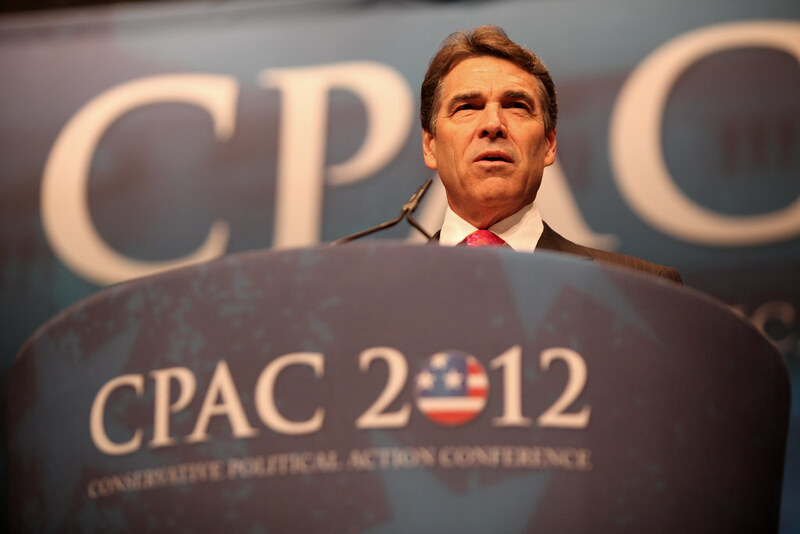 Mother Jones’s Patrick Caldwell wrote that Perry was “a consistent skeptic when it comes to humanity’s role in warming the planet” until 2015. He’s used the “I’m not a scientist” line and followed it up with other canards like “I don’t believe that we have the settled science by any sense of the imagination to stop that kind of economic opportunity…Calling CO2 a pollutant is doing a disservice the country, and I believe a disservice to the world.” Those are patently untrue. Any person with access to the internet has been able to disprove climate denial since the Telnet days. Someone in his position could find out with a phone call and a conversation to his own state climatologist, flagship public or private universities, or any of a number of scientific organizations. But has the new, hip, and aware Perry done anything that might put us a little at ease? Under his administration wind power took off. Texas leads the nation in energy exports and energy production and easily produces the most wind power. “Texas took the national lead in wind energy development, and now produces more wind power than all but five countries,” he said. This is an especially important point because of Texas’s massive energy exporting role. He also recognized that Texas needed the federal government to do it. He and Tammy Duckworth (D-Ill) had an exchange reported on the American Wind Energy Association blog. Duckworth: With the successes you’ve seen in wind energy, I know you must recognize that these gains could not have been made without federal support. Our nation’s wind industry would not be where it is today without the federal government. And I want to replicate the success in wind energy that you saw in Texas under your leadership. I want to do that in Illinois and across the nation. Perry: My homestate aggressively and very positively supported [wind growth]. There is I think a role for the DOE as we go forward, continuing to find the technological advances, whether it’s on turbines, whether it’s on blade design, whether it‘s on some other aspect… I do believe there is a role for us to play, both at the state level and at the federal level, to continue to put forward – funded by our taxpayer dollars – technologies that can in fact make us more efficient, make us more economically viable, improve our quality of life… That is what I believe, and the Administration knew that when they asked me to serve in this role. So Perry sees a suite of benefits–efficiency, economic strength, and high quality of life. He’ seen a wind power’s job windfall in turbine manufacturing, installation, maintenance, and transmission. Texas houses a large chunk of the 100,000 workers in American wind power. But it is the home of oil and gas and the emissions that come with it. Despite having a smaller population than California, Texas releases nearly double the heat-trapping gases because of fossil fuel production and the fact that they produce and export so much electricity onto the grid. Climate Central reported, “Texas emitted more carbon dioxide from burning energy in 2013 than it did at any point since 2004. And, for at least the 24th year in a row, the Lone Star State tops the list of the nation’s biggest carbon polluters, according to U.S. Energy Information Administration.” That was not a good sign. Perry touts an all-of-the-above energy strategy. Fracking for oil and gas play key roles in that. We should worry about that on climate alone. Methane is 70-105 times as potent a greenhouse gas as carbon dioxide over 20-year time spans. And we have good evidence that it’s leaking from fracking operations. These “fugitive emissions” are leaking from drilling, compression, and pipeline infrastructure. We should be very skeptical of Perry’s–and the EPA’s for that matter–rosy portrait of reduced greenhouse gas emissions from natural gas power. As the EPA reported last August, oil and gas development emissions of methane were about 15% higher than originally estimated. That’s really bad news. We should have been phasing natural gas out more aggressively in recent years but haven’t, lulled into a sense that it’ll be okay because natural gas is a long bridge to renewables. Hog wash. Recently, Carbon Brief calculated the carbon budget for the coming years. Basically, that’s the amount of greenhouse gas we can put into the atmosphere to keep warming below certain thresholds. The budget is not looking pretty for big spenders. Global society has about 20 years of emissions at current levels to get a 66% chance of limiting warming to 2 degrees C. 3 degrees is pretty easy but it’ll lock in some really wicked feedbacks that will result in catastrophes. With the US making up a large portions of total emissions, it’ll mean getting away from both coal and natural gas for power production more rapidly than Perry is willing to admit. Is Perry a bad choice? He’s 50 years ahead of where the Republican platform is and twenty or more years behind where we ought to be. That’s too far behind. Given his track record in Texas coupled to his past denier talking points, he’s about where Obama was in 2009 with talk of carbon capture, enhanced oil recovery, smart grids, and renewables. In the context of other disastrous picks like Scott Pruitt, Perry looks sort of alright. If he holds to his commitments on scientific research–especially around energy and environment and renewable development–he might be palatable. Here’s to hoping he does. But I’m not holding my breath.